250 million years ago, after the supercontinent of Pangea formed, Virginia was located in the middle of that supercontinent. The diversity of life had been dramatically reduced by the massive extinction event at the end of the Permian Period. Immense lava flows from fissures in Siberia had moved massive amounts of carbon dioxide into the atmosphere. Acid rain had moved it back to the surface. The chemistry of the oceans changed, perhaps in part because plates of continental crust blocked currents and oxygen levels declined significantly. Sulfate particles in the atmosphere reduced the amount of sunlight reaching the surface. The change was too fast for the different forms of life to adapt. Within just 100,000 years, 95% of species in the oceans died out. On land, 70% of the terrestrial species died. Nearly all the trees disappeared, creating a spike in fungi biomass as they decomposed the rotting biomass of the victims. The change in the fossil record resulting from that extraordinary extinction event is the basis for geologists making a distinction between the Permian and Triassic periods. The Triassic Period began with global warming, triggered by the greenhouse gas effects of the high carbon dioxide levels. Carbon dioxide levels were six times greater than those of today, reaching 2,500 parts per million. Pangea stretched from the North Pole to the South Pole. There were no ice caps, in part because no land mass blocked currents in the Panthalassa Ocean which carried heat from the equator to the poles. Megamonsoons swept across Pangea, bringing rain inland from wet coastal areas and creating extreme differences between the seasons. The extinction of so many species, and the creation of a wide range of wet and dry habitats on Pangea, created unoccupied niches. 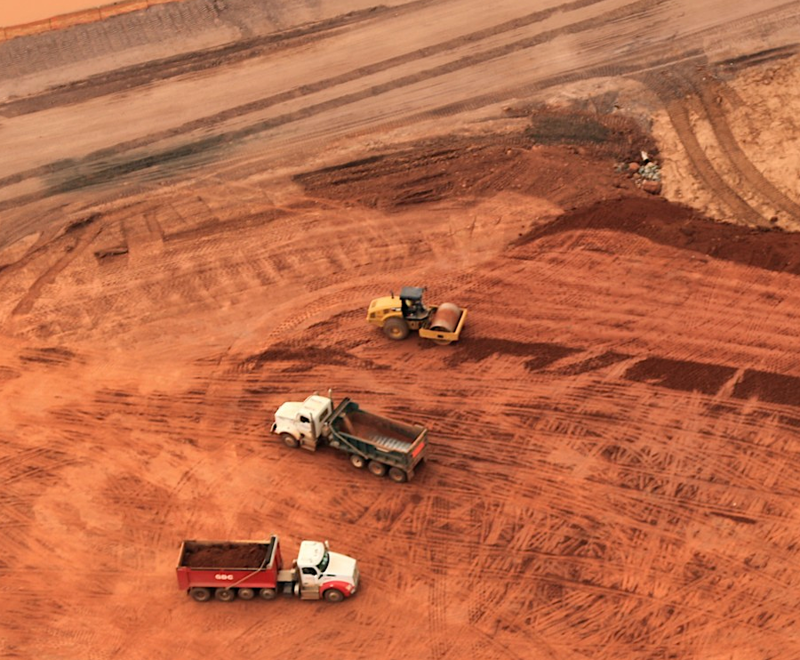 New forms of life evolved to replace the species that died out in the Permian extinction. ...You would probably consider the dinosaurs a fairly marginal group. They were doing OK, but so were many other newly evolved types of animals. After the collision of the North American and African plates, Virginia ended up in the middle of Pangea. 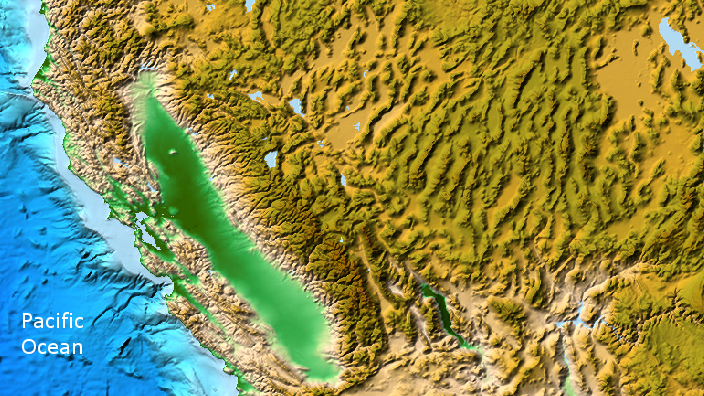 Island arcs similar to Japan, Indonesia, or the Aleutian Islands today had been smushed against the Virginia coastline on the Iapetus Ocean. 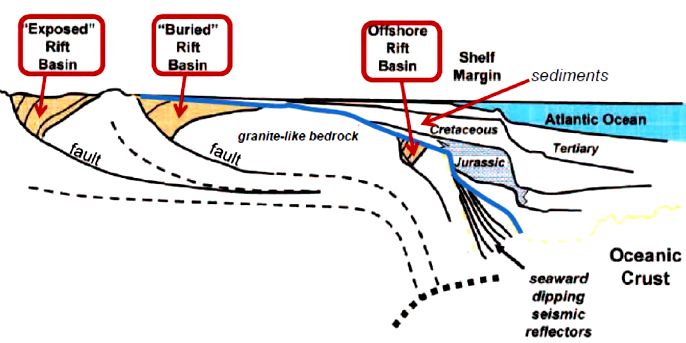 The additions of those island arcs ("terranes") expanded the crust of Virginia, until the collision with the African plate. At the end of the Alleghanian Orogeny, the ancestral Appalachian mountains were far from any ocean. Africa made Virginia smaller, initially. The African Plate compressed the sediments of the continental shelf on the North American Plate, converting the Iapetus Ocean beaches of Virginia into hard crystalline rocks. Today, those old sediments are part of the Piedmont "basement" rocks. They are exposed clearly at Great Falls on the Potomac River, and today fill the space between the Blue Ridge and the Fall Line south to the North Carolina border. During the Alleghanian orogeny, the African plate kept pushing against the North American Plate for millions of years. Virginia was caught in the middle, and the bedrock on the eastern edge of Virginia cracked under the pressure. Mountains as high as 20,000 feet were pushed up, comparable to how the modern Alps and the plateau of Tibet are being created as India crashes into the Asian tectonic plate. About 250 million years ago at the start of the Triassic Period, the rocks of modern-day Shenandoah National Park were once located roughly where I-95 is today. The collision with Africa, the Alleghanian orogeny, had shoved the Blue Ridge miles to the west. 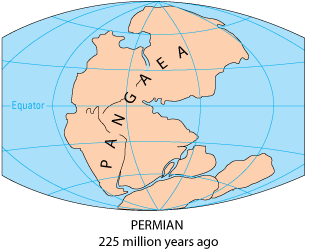 During the formation of the supercontinent of Pangea, all the continental crust clumped together. The resulting wide crustal plate began to trap the heat rising up from the mantle and became unstable. Pressure from the trapped heat and changing flow patterns of molten rock in the mantle began to pull Pangea apart, just as Rodinia had cracked up earlier. No supercontinent lasts forever; crustal plates move in cycles, and supercontinents break apart into smaller components. As the African, North American, and other plates pulled apart, the crust in the middle of Pangea stretched. Earthquakes were common in what is now Virginia. As the land spread out, the crust thinned. The sandstones created from those sediments are known as "redbeds" due to the oxidized iron or rust that coats the sand grains. 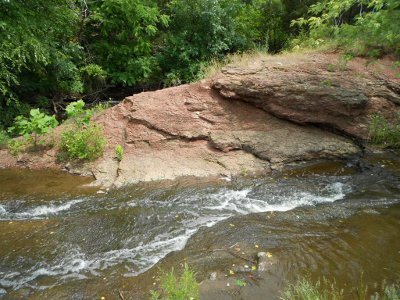 The grains in the sandstone bedrock were cemented together more tightly than the Aquia Sandstone on the Coastal Plain. 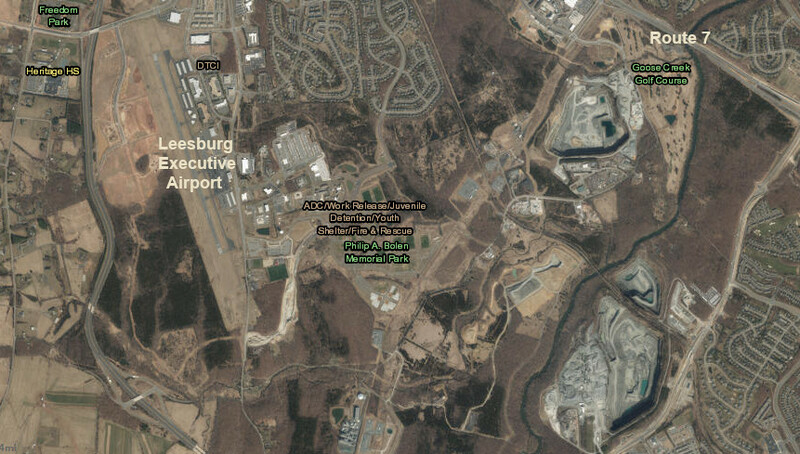 In Northern Virginia, drivers headed west on I-66/Route 29 may notice the Culpeper Basin west of Centreville. The valley stretches to the Bull Run Mountains, where the interstate highway goes through Thoroughfare Gap, on its way to the Shenandoah Valley. The drop in elevation west of Centreville reflects differences in the bedrock. 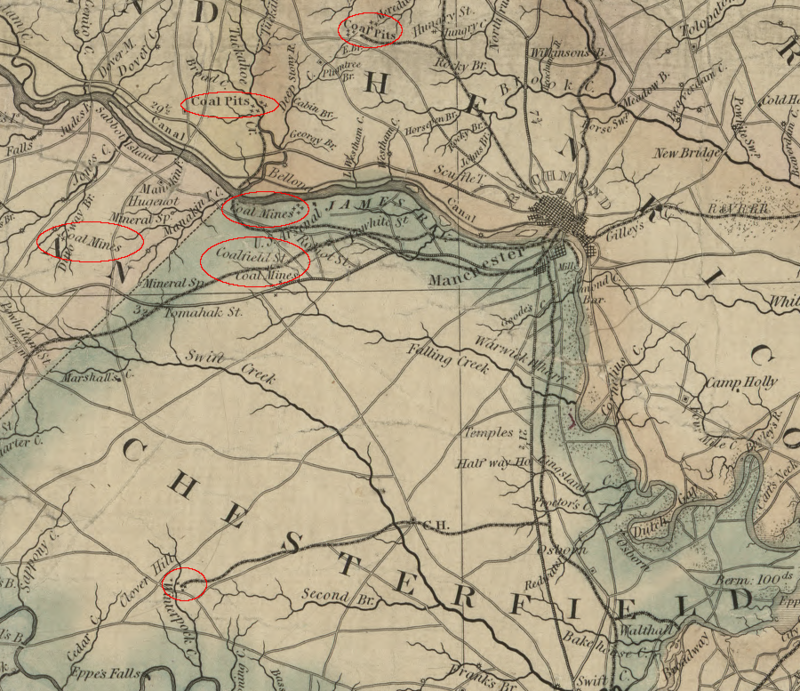 Differential erosion has, for the moment, excavated a shallow valley in which Leesburg, Manassas, and Culpeper are located. 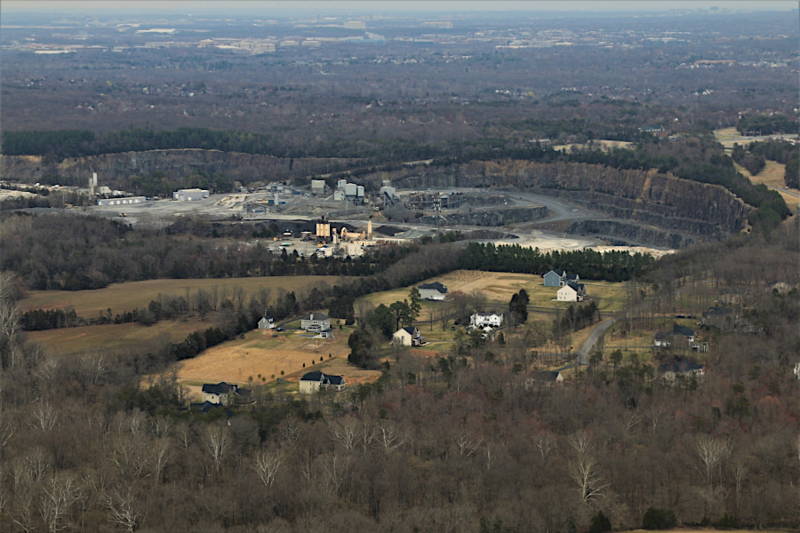 The sediments in the Triassic Basin west of Centreville are eroding faster than the metamorphic bedrock of the Piedmont formations to the east, between I-95 and Centreville). 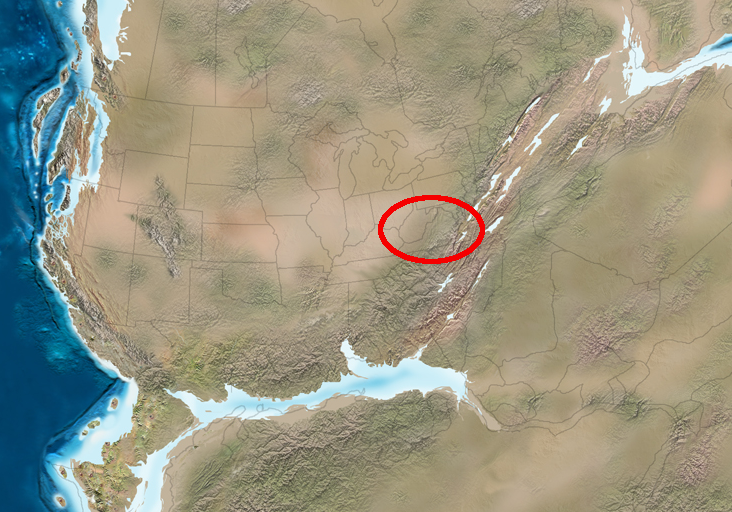 The Triassic Basin is also eroding faster than the metamorphic/volcanic formations of the Blue Ridge to the west. 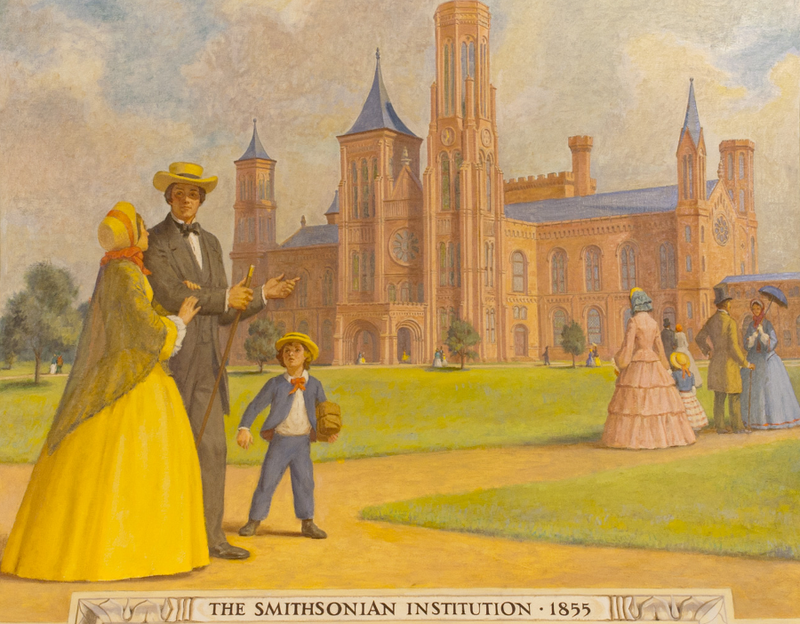 The reddish/purple sandstones from Triassic basins oxidized after quarrying to become the "brownstones" used in many of the buildings in Brooklyn, plus in the Smithsonian "castle" on the National Mall in Washington DC and the Stone House at Manassas National Battlefield Park. In addition, some harder rocks formed in the basins. In some places where the crust thinned, molten magma rose from the mantle up into the Triassic basin sediments to the surface and cooled into igneous rocks known as basalt. Where the rock cooled slower and larger crystans formed, the volcanic rock is known as diabase. 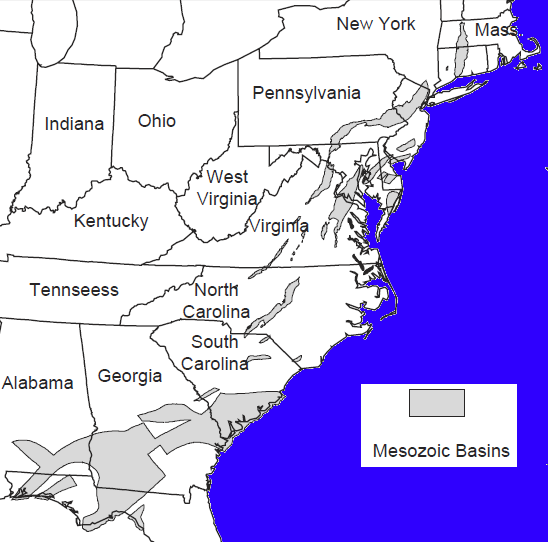 Source: King George County, Taylorsville Basin Community Meeting - June 12, 2014, King George County Fracking 101 Basins formed at cracks where the land dropped, from Connecticut to Alabama, during the Triassic and Jurassic periods in the Mesozoic Era. Volcanic magma rose where the crust thinned and broke to create sills, dikes, and lava flows on the surface. Because the breakup of Pangea triggered formation of the basins starting in the Triassic Period, the depressions are called Triassic basins even if they continued to expand and lava continued to rise during the Jurassic Period. The Central Atlantic Magmatic Province (CAMP) was one of the largest flood basalts in the history of the earth. Lava flowed over what is now the edge of Eastern North America, Brazil, and Northwestern Africa. Massive amounts of rock were extruded, bringing to the surface rock that may have been pushed deep by subduction in the Acadian/Avalon orogeny. Ultimately, a "spreading ridge" developed, oozing magma with the chemical composition of Mid-Ocean Ridge Basalt. The Atlantic Ocean was born, expanding into its current configuration over the last 200 million years. Steven Spielberg highlighted the Jurassic Period when he titled his movie "Jurassic Park" because that was the period in which dinosaurs evolved further to dominate the land masses. The moviemaker took artistic license with the geologic time scale; Tyrannosaurus rex evolved only near the end of the Cretaceous Period. 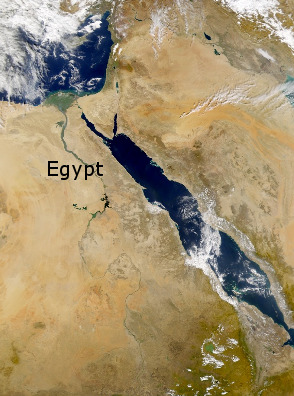 The first lava flows reached the surface in what is now Morocco, then Brazil and North America. There were four distinct waves of rising lava over just 600,000 years as the crustal plates shifted. Along with the lava came carbon dioxide. The greenhouse gas led to warmer oceans, melting ice crystals (clathrates) that had trapped methane. Average temperatures climbed 3-4 degrees Celsius (5-7 degrees Farenheight) and the ocean grew more acid, interfering with production of limestone shells of invertebrates and plankton. 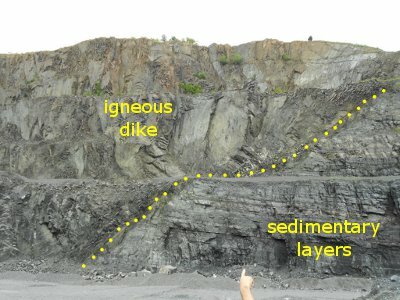 Where magma cut through the sedimentary layers, it formed "dikes" of near-vertical pipes of igneous rock surrounded by flat-lying sediments. Where the magma squeezed between flat layers of sediments, it shoved some sandstone/shale layers upwards slightly before the igneous rock cooled into "sills" of diabase rock. 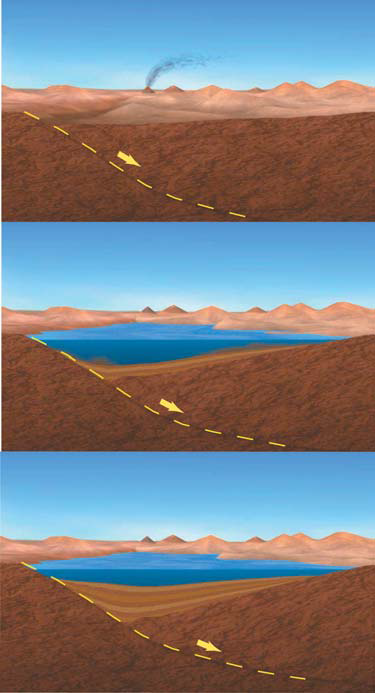 "Broad-terrane Jurassic flood basalts across northeastern North America," in Geology, April 1996http://earth2geologists.net/Publications/McHone_Geology96.PDF"